If your nonprofit is serious about cultivating a major giving program (and have the funds to do so), your first step should be to look into bringing a major gift officer on board with your team. For those of you who may be unfamiliar with this role, a major gift officer (MGO) is typically in charge of a nonprofit’s major giving initiatives. To accomplish this, large organizations may rely on major giving teams while smaller ones just focus on hiring one major giving employee at a time. 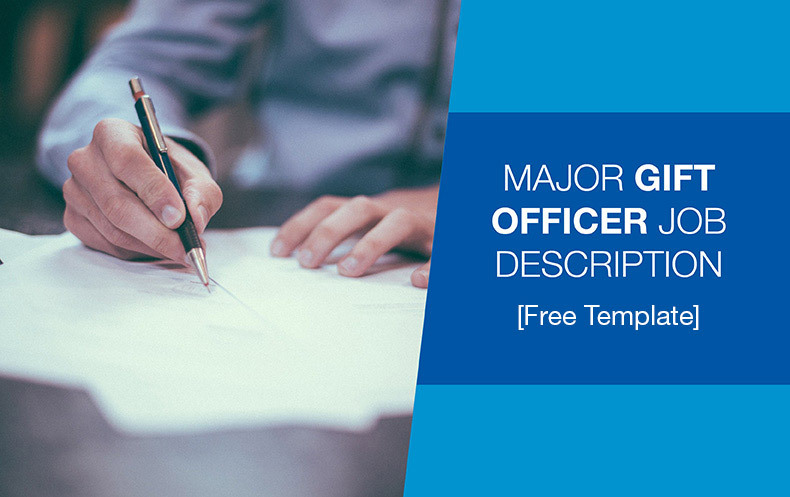 Major gift officer job description template. Major gift officer role expectations. Key responsibilities, duties, and activities of a major gift officer. Respective recommended education and experience levels for major gift officers. Necessary skills to be an effective major gift officer. By the end of this guide, your nonprofit will not only learn more about the purpose of a major gift officer, but how to attract the best candidates possible for the position. Let’s begin by delving into how your major gift officer job description should appear to applicants. Due to the social nature of the major gift officer role, chances are that your pool of contenders will be an assortment of outgoing individuals. That’s why when describing the major gift officer job, it’s best to utilize a welcoming attitude along with a professional tone to better engage your target group of candidates. This letter has made its way into your hands because our nonprofit, [Insert nonprofit’s name here], has decided to expand our major giving program by bringing on board a major gift officer — and we think you’d be an excellent fit! This critical role is perfect for a nonprofit veteran who can generally read people well, as well as attract and cultivate meaningful relationships with prospective donors. In addition, potential candidates should meet the following criteria: [List in-depth qualifications for the position here]. A love of [Insert nonprofit’s focus here] is also a plus! Your well-rounded experience with nonprofit development speaks for itself, and we’d be interested in getting to know you better to see if your personality and ambitions align with our vision of a major gift officer. If you’re interested in taking us up on this life-changing opportunity, simply fill out and mail in the application portion of this letter or visit our website to complete an online application. Thank you for all of your hard work in the nonprofit sector and we look forward to connecting with you soon! This personalized approach not only succeeds in flattering the letter recipient, but provides ample room for an in-depth job description of your nonprofit’s ideal major gift officer. Even though every nonprofit’s major giving needs are different, a major gift officer should always abide by these necessary expectations. To help you gain a better understanding of what you should expect from your major gift officer, we have a list of four key responsibilities. Major gift officers must be prepared to assist in finding donor prospects; a process that involves analyzing factors that predict a donor’s ability and enthusiasm to give. At times, major gift officers will work closely with prospect researchers to determine the best candidates for their organization’s major giving program. Cultivation is critical when it comes to major gifts because it’s your organization’s opportunity to build valuable relationships with major gift prospects. Without the right cultivation strategies in place, your nonprofit will have a very difficult time acquiring major donations. At the end of the day, you can’t have a major giving program if you’re not actively seeking major gifts. At a certain point, prospective donors have to move along the donor pipeline and major gift officers should be there to help direct them through the process with ease. To develop a powerful donor solicitation strategy, a major gift officer must also be prepared to partner with your nonprofit’s development director. Contrary to popular belief, your relationship with a major gift donor is not over the minute they make a donation! Rather, it’s your major gift officer’s responsibility to build that relationship by stewarding the donor. In this way, your nonprofit encourages donors can continue giving to your organization as well as explore other avenues of support. In addition to these responsibilities, discuss with your organization’s team and your executive search firm (if you’re using one) to outline any other expectations your nonprofit has. By making sure that all of your major gift officer candidates exceed these core expectations, your nonprofit will weed out top contenders for this essential role. Seeing as we’ve already touched on the definition of a major gift officer, this section will focus more on specific responsibilities, duties, and activities of the position. The scope of your program — Will your major gift officer be a one-man show or part of a major giving team? The presence of prospect researchers — How does your organization research its prospects? Do you use a service, a staff member, consultants, or a combination of all? The aims of your program — How much are looking to gain from this major giving initiative? Coordinating the major gift program and communications between prospects and your organization. Designing an effective major gift donor stewardship program. To help determine what responsibilities are unique to your major gift officer, your nonprofit can always consult an executive search firm to help you conceptualize the role as well as hire and train your newest team member. For a list of top executive search firms tailored to nonprofits, check out this definitive guide from Double the Donation! Above all though, let your major gift officer lead all things major giving! Like most types of fundraising, major giving is something that’s best learned through experience. The position is a hands-on process that you can’t wholly experience in a theoretical, educational setting. With that in mind, the person your local nonprofit hires to act as major gift officer needs to have an extensive background in fundraising in order to be prepared for the role. Major gifts are a serious endeavor and you have to have someone with the appropriate experience to pave your path to program prosperity. As far as education goes, you’ll want to look for a candidate with a bachelor’s degree as well as some additional fundraising-related certifications and degrees. For instance, did you know that there are programs where you can get master’s degree in fundraising management? Education is essential in determining the caliber of the candidate, but at the end of the day, experience should be your number one priority. After considering the definition, list of responsibilities, and appropriate experience level, your nonprofit by now should have a solid picture of what you’ll want to look for in a major gift officer applicant. Which brings us to the last piece of the puzzle: skills. While screening applicants, your nonprofit’s executive director and search committee should always be clear on the right combination of skills you’re looking for to bring new life to the major gift officer role. Major gifts are the big leagues of fundraising. That’s why your program won’t succeed on emails and a sporadic string of social media posts alone. You need a team member who has encountered numerous fundraising situations and understands how to apply that experience to your program. As captain of your major giving program, your major gift officer should have superior knowledge of all aspects of the fundraising job from managing prospective donors and reporting to superiors to coordinating with fellow fundraisers. That being said, the role of a major gift officer isn’t a solitary one. This position is designed to be a link between your organization and your major gift prospects which means the employee has to manage a variety of interactions. From drafting direct mail letters to giving solicitation presentations, your nonprofit must find someone who is not only comfortable in those settings but excels in them. All nonprofits know that prospects will not always say yes and, even if they do say yes, getting to the point of asking is not without its challenges. There’s no doubt that requesting a major-gift-size sum of money is intimidating and not something that’s traditionally in most people’s comfort zones. That’s why your nonprofit major gift officer must be open to working through the challenges of these prospect relationships, and have the confidence and ambition to never give up, even after a stream of rejections. Along with these three skills, think through what makes a good team member at your organization by considering your office environment and making sure that personalities mesh well. After all, the success of your major giving program is closely connected to the officer, but the best programs function well within the broader expanse of their organization’s development team. By following through with these key search elements, your nonprofit should track down an extraordinary major gift officer in no time. 7 Tips for Hiring a Top-Notch Nonprofit Development Expert. Follow Qgiv’s best practices to plan for, hire, and train your nonprofit’s newest addition to the team. Nonprofit Staffing: 5 Tips for Developing Executive Roles. Discover @Pay’s approach for integrating major giving programs and positions at your startup nonprofit. 11 Nonprofit Job Boards for Finding Your Dream Career. Check out the top job boards for nonprofit job hunting with Aly Sterling Philanthropy’s definitive ranking.